Noah and Alex Hamer on board Lickety Split are ready to catch some fish! Darryl Hamer, Mark LeSage and Darryl's sons Alex and Noah had a whale of a trip to camp last summer by catching some whales of their own. They nailed the big northern pike as shown by these photos. They were one of the groups that did very well on larger lures. I mean they caught bunches of lunkers. Last summer was a veritable hit parade on big northern pike for just about everybody. The reason? Well, here's probably the main one: nearly everybody --including these guys -- released all of their big pike. Pike like these are the major spawners in the lake. They also likely have the genes for fast growth and big size. Every time we release a big fish we are increasing the odds of catching another big fish. Eat the small ones and let the big ones go. It is the new normal and is it ever working! Thanks to you , Brenda and the entire crew Dan. 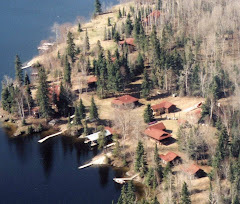 Bow Narrows will always be our Red Lake home.